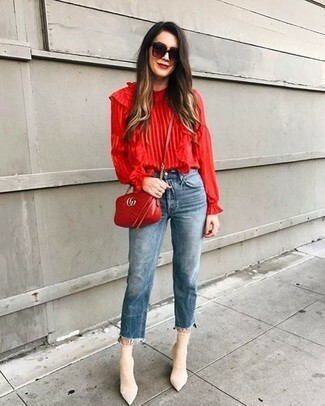 If you're obsessed with relaxed dressing when it comes to fashion, you'll love this adorable combo of a red ruffle long sleeve blouse and a red quilted leather crossbody bag. Make beige elastic ankle boots your footwear choice to instantly up the chic factor of any outfit. Consider teaming a blue floral short sleeve button down shirt with a Miu Miu matelasse leather shoulder bag to be both killer and relaxed. When it comes to shoes, this getup pairs nicely with silver leather flat sandals. If you're all about functionality dressing when it comes to fashion, you'll love this totally stylish pairing of a black fur jacket and a Miu Miu matelasse leather shoulder bag. Add a glam twist to your getup with black suede pumps. If you're a fan of relaxed dressing when it comes to fashion, you'll love this cute combo of a light blue embroidered dress shirt and a Miu Miu matelasse leather shoulder bag from Nordstrom. When it comes to footwear, this getup pairs nicely with tan suede ballerina shoes. Pair a silver sweater dress with a red quilted leather crossbody bag, if you feel like comfort dressing without looking like a slob. To add oomph to your getup, finish off with navy embellished satin pumps. If you're a fan of comfort dressing when it comes to fashion, you'll love this totally chic pairing of a dark brown coat and a red quilted leather crossbody bag. Kick up the cool of your getup by rounding it off with red leather knee high boots. If you're obsessed with relaxed dressing when it comes to your personal style, you'll love this extra cute pairing of a multi colored print bodycon dress and a Miu Miu matelasse leather shoulder bag from Nordstrom. Wearing a pair of beige leather pumps is a simple way to add extra flair to your getup. 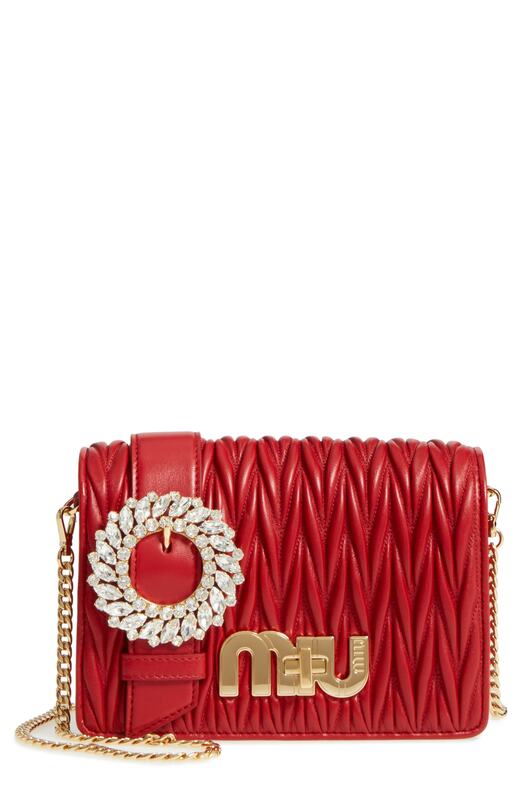 If you're all about practicality dressing when it comes to your personal style, you'll love this totally chic pairing of a white chiffon shift dress and a red quilted leather crossbody bag. You could perhaps get a little creative when it comes to footwear and dress up your look with white leather pumps. If you're obsessed with functionality dressing when it comes to fashion, you'll love this extra adorable pairing of a tobacco coat and a red quilted leather crossbody bag. Amp up the cool of your outfit by completing it with burgundy velvet pumps.